The lack of sleep and the germs from daycare and all of the running around is catching up with me. The seasons are changing and, unlike most of the population, when the Sun starts shining and the birds start chirping I don’t skip along joyfully smiling and sniffing the peonies. I sweat and sneeze and whine and wheeze. I do not feel rejuvenated and refreshed, I feel worn and ragged. It’s like my fragile inner self is exposed when I shed the protective outer shell of my winter wardrobe. I look as strong as a rock, but I am just pumice. Full of holes. Easily eroded. Infant Grouch was already in bed for the evening and Mr. Grouch, recognizing my weariness (read: crankiness), took Toddler Grouch out for a car ride to give me a half hour window of quiet time so I could nap. Just as I shut my eyes, the baby started crying. Infant Grouch made enough of a fuss that I felt I needed to go into her room, reach into her crib and pick her screamy little self up. When she was in my arms her cries subsided immediately but her hiccupy catching of the breath lasted for a long time after. I wiped the salty streaks from her cheeks. Eventually she softened. I sat in her room and held her. I am typically not a proponent of rocking my kids to sleep even though I know myself well enough to admit that personally I can’t handle implementing the cry-it-out system. 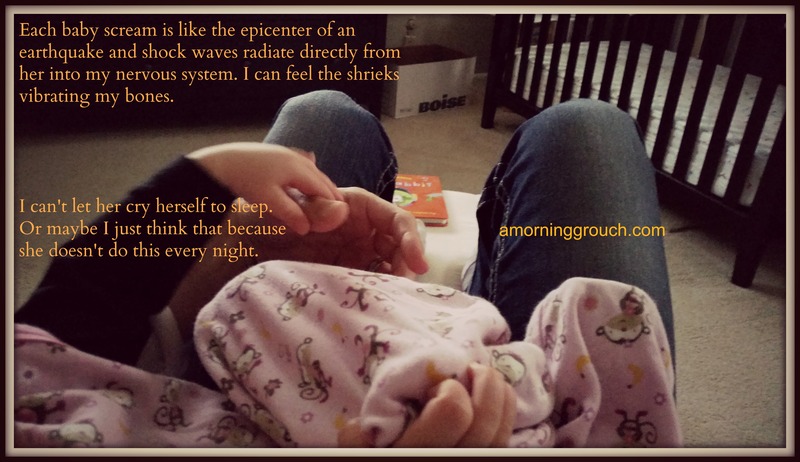 Each baby scream is like the epicenter of an earthquake and shock waves radiate directly from their little bodies directly into my nervous system. I can feel the shrieks vibrating my bones. I am unable to tune it out, I can’t focus on anything else with the screams echoing in my ears. 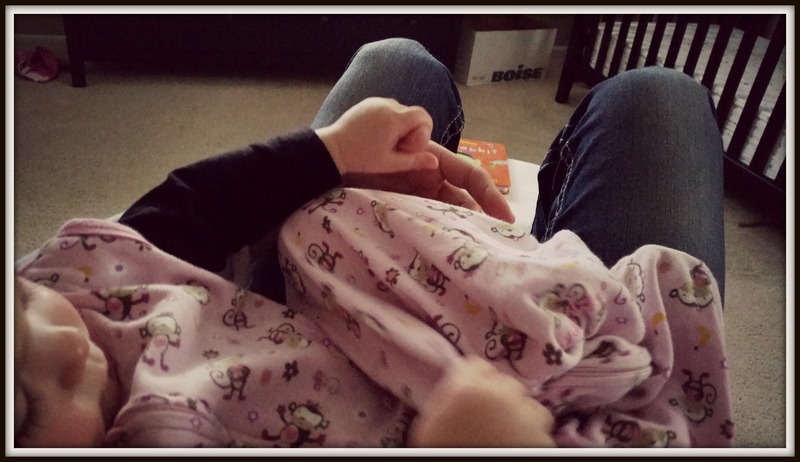 Even though I was exhausted, I knew I couldn’t leave her to cry herself to sleep. Maybe I just think that because she doesn’t do this every night. At least she hasn’t so far. I probably have prided myself far too much about the fact that my babies generally fall asleep in their cribs awake and I have mentally poo-pooed those who say they are forced to hold their kids until they are sleep on a nightly basis. But this evening, my body melded with the cushions while her body melted into mine. And I kept rocking. Maybe this is how it begins. She grabbed my hand and squeezed it hard enough to stop the blood from flowing to my fingertip, and it must have caused an unnatural backflow of blood surging back towards my chest because even when I wanted to be mad at her for not letting me rest somehow she managed to lift me up out of my horrific mood. She unearthed a rare gem out of the rough. I can’t let my baby cry it out. I always rocked my girls to sleep. Every night we sat in the rocker, I read them some stories and then rocked them. I loved the bonding time with them and it was a decompression for me at the end of the day. It broke my heart the first time my oldest popped out of my arms and ran into her toddler bed to go to sleep. Neither of my kids are any worse off for it and they never gave me a hard time when it was time to go to bed. Yes, I totally get that decompression/bonding time! A lot more relaxing than having to do it or the kid will scream so you’re complaining about it – so your version is a thing of beauty in my mind – just so you know! We do a lot of cuddles/book reading too. Love the night time snuggles. You are a gem, and even though you sometimes struggle because of your strong emotions you are you and what comes from you is good. Your children (and those who come in contact with them) will benefit from your parenting. Sounds about right. Just when you let your guard down and think “I think I’ll shut my eyes…” crying! And the way you described the crying couldn’t be more true for me. I can’t stand listening to our girl cry. Blood pressure shoots up, and every fiber in my being is screaming for me to make it stop. Glad you saw the light in a moment of love. Good story to share. seriously. every fiber in my being screams! so true. Now that she’s a year old we are back to waking up multiple times a night but I can’t let her cry this time, I just can’t..so if rubbing her back whilst she’s in the cot doesn’t work then we bring her into bed with us and we all sleep..beautifully cuddled and entangled. I’ve been telling myself ‘That’s how it begins’ for weeks and everyone keeps say to nip it in the bud but I’ve decided to let it go and just do what works for everyone at this point in time. She has gone in and out phases before, she will do the same this time, hopefully! desperate times DO call for desperate measures. it’s always so hard to hear them cry but if you’re doing what is best you just gotta do it. even though it is so hard. like taking a kid to get vaccinated. I am just the same! I could not let them cry it out! Oh man. So hard!! 23 months…..vut I’m with you…I look at my clock and 5 minutes is my max too. Hang in there! ….and this is why my laundry is never done. It just feels right. Somehow, they always make you feel better even though they are stressing you out. The paradox of motherhood!